Foundation Structure Response or the structure vibration below the ground level is equal to the incoming ground vibrations. Whole-Structure Response or the racking motions, of the above ground part of the building, that respond to frequencies of 4 Hertz to 12 Hertz. Mid-Wall Response or motions within individual panels or components of the above ground part of the building, normally out of plane with walls, responsive to frequencies of 12 Hertz to 20 Hertz. 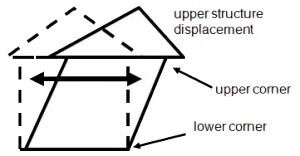 In the whole structure response, the above ground portion of the structure is free standing, and moves more than the below ground portion because the foundation is fixed. Differential motions between the upper and lower corners cause racking responses. Mid-wall responses are typically responsible for window rattling, picture tilting, etc. When the vibration frequency closely matches a natural or fundamental frequency of a structure or structural component, the structure or component will tend to respond more vigorously and the incoming ground vibrations are amplified in the upper portion of the structure. Alternatively, if the ground vibration frequency does not match the natural frequency, very little seismic energy transfers into the structure, and there will be little, if any, response.